Get paid to surf with the Incent toolbar! With most of the crypto world suffering a comprehensive mauling by the bitcoin bear, it’s worth taking a step back and remembering what the ultimate goal is in all this. Incent’s vision is to drive crypto adoption by connecting everyday consumers to mainstream merchants and businesses. We’ve just launched the beta version of our Chrome toolbar, and the first 5,000 people to download it will get paid in Incent simply to surf the web. At this point, we’re looking to iron out any glitches, fine tune it and gain as much feedback as we can, before moving onto stage 2: an affiliate scheme which will enable consumers to receive crypto rewards for shopping online. After that we’ll be targeting specific brands for direct integration. This is still just our proof-of-concept, but there’s some refreshingly wonderful about seeing your balance tick upwards as you go about your business online. And it won’t take a lot of imagination to see where this is going to lead: on-demand rewards for just about any activity businesses want to incentivise. 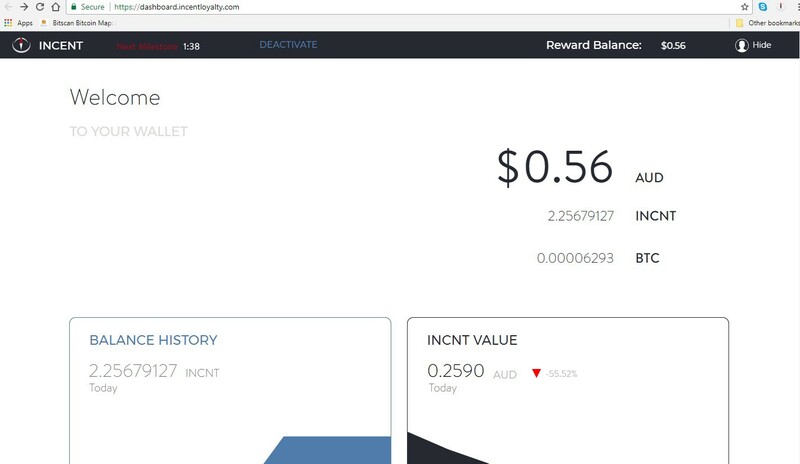 To download the toolbar and give it a test drive, visit www.IncentLoyalty.com and click Get Incent. You can give us your feedback on our Slack. Daily rewards are capped and when we enable withdrawals you’ll need to go through a brief KYC process.